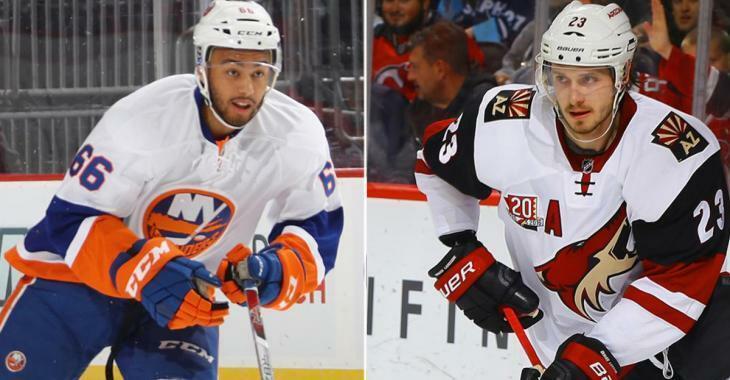 NHL News : Rumor: Huge swap between the Isles and Coyotes? Rumor: Huge swap between the Isles and Coyotes? In his latest article for the New York Post, long-time New York Islanders and New York Rangers columnist Larry Brooks takes a look at the Isles’ situation with John Tavares and attempts to find a solution for GM Garth Snow in advance of this season’s NHL trade deadline. His solution? Bolster the lineup and show JT just how committed to winning the franchise is. Brooks highlights an obvious trade target for Snow: Arizona Coyotes defender Oliver Ekman-Larsson. But, what will it take for Snow to land OEL? How about “either Josh Ho-Sang or Anthony Beauvillier, perhaps Brock Nelson, maybe Ryan Pulock or Scott Mayfield, and probably one of the two first-rounders (their own plus Calgary’s) they own in the 2018 draft”, according to Brooks. It’s an intruding proposition, no doubt. But it’s unlikely that Coyotes GM John Chayka would be interested in trading OEL for anything less than a top notch, sure-fire, can’t miss prospect plus some additional pieces. Currently, the Isles only have Matthew Barzal fitting that description and there’s virtually no way they trade him. Still… until the Isles either make a move on Tavares or lock him up long-term, expect the trade rumors to continue.